One month's supply of Collagen AM, Collagen PM, C.L.A. and Extreme T along with a complimentary pill box. This package is designed for men who have excess weight in the Tummy area. The Tummy Saver +Extreme T is Gentle Solutions' combination of the Collagen AM, the Collagen PM, the C.L.A and our Extreme T supplements. These supplements are taken together to maximize results for men who have excess weight to lose in the tummy area. 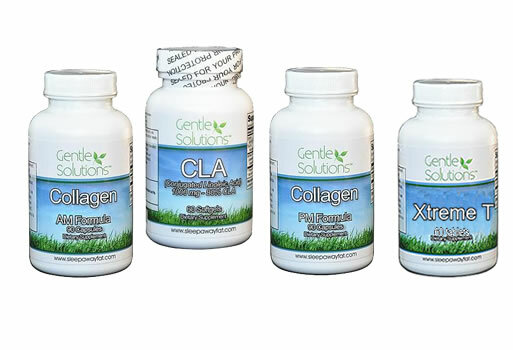 Included in this package is a one month's supply of Collagen AM, Collagen PM, C.L.A. and Extreme T along with a complimentary pill box. Collagen AM formula: Take 3 Collagen AM capsules immediately upon waking in the morning and then do not eat or drink for one hour (you can drink water). C.L.A. : Take at least 1 capsule an hour before lunch and dinner. You may take up to 6 C.L.A. a day to increase results. Collagen PM formula: Take 3 Collagen PM capsules intermediately before bedtime, however you must stop eating and only drink water 3 hours prior to going to bed. Extreme T: Take one capsule morning and night. Can be taken with or without food.